Release Info: Bob & guitar in his living room. 26 tracks. Only available online. Limited to 500 copies. 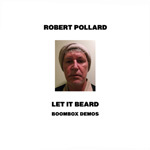 Release Info for Free Digital Download on GBVDigital.com: Pollard's living room demos for the Boston Spaceships ultimate classic Let It Beard. A fascinating listen. The limited edition CD sold out in one day... and the price of the download is FREE!